There is a new restaurant and probably the only place now serving Dim Sum in Baltimore (really Ellicott City) called Asian Court. The recommendation came a roundabout way from my sister who lives in California who corresponds with an old friend, Jeff Davis, who lives most of the time in Hong Kong and was recently in Baltimore and found this new gem. When I advised Jeff that I had made it to Asian Court for Dim Sum for lunch this week he replied. “hope u can return there on the wkend for the dimsum specials, as it is quite worthwile 'n u will see a mix of almost 95% Asian there w/their families, 'n w/it a whole different feeling 'n atmosphere, not unlike the real thing found more often in Asia...and the food served reinforces same...” (quite obviously Jeff is a cryptologist as well – only joking). I had put out an all-points bulletin to my food buddies but scheduling has been a problem. I like traveling in numbers for food, it means I get to sample more dishes. 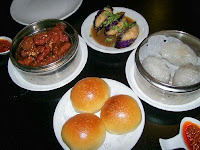 It was decided we would go one weekend for the Dim Sum when it is served on the rolling carts. The Dim Sum is cooked to order during the weekdays from 11 a.m. to 3 p.m. and on the Saturday, Sunday and holidays, from 10 a.m. to 3 p.m. on the carts as stated above. Well scheduling with everyone has been difficult and when another friend said she and her husband were available for lunch this week we went over to the west side of town to Asian Court in Ellicott City. It is in a strip mall just passed Home Depot heading west from where 29 intersects Route 40. The restaurant wasn’t full but as Jeff Davis said above, the majority of the people in the restaurant were Asian – always a good sign. The dining room seemed divided with tables with tablecloths and some without. The restaurant is nicely appointed with a tank of beautifully colored fish between the sushi section and the bar. The entrance was marble. Don’t let me lead you astray with the dim sum; this restaurant serves a broad selection of Chinese dishes from ones we have come to know and ones that Anthony Bourdain might eat like Sauteed Pigs Intestine with Sour Cabbage and Pigs Feet with Bean Curd Sauce. Asian Court has a broad Japanese menu along with some delicious sushi. Also there is a large vegetarian selection. So my dining posse and I wanted to try a little of this and a little of that and we kicked it off with Char Siu Bao-$3.25 ( bun stuffed with barbecued pork – your choice steamed or fried), Fung Jeow $3.25 (chicken feet, deep fried, then marinated with oyster sauce and steamed), Fun Gor $3.25 (translucent dumplings that are filled with ground pork with peanuts) and finally Stuffed Eggplant 3.95 (purple eggplant stuffed with a shrimp paste, fried and topped with a sauce). I grew up eating chicken feet in my mother’s chicken fricassee and she used them to make chicken soup so this wasn’t a stretch for me. They are messy, they have a lot of bones but if you are so inspired, do give them a try and ask for extra napkins. Next on our adventure was some sushi and as you can see it arrived beautifully displayed. We ordered Maki Rolls: Salmon Skin Roll $4.50, Eel with Cucumber $4.95, Shrimp Tempura $4.95 and Spicy Tuna Roll for $4.50. I really liked their sushi and it was because of their rice, it was well seasoned. So many times I get sushi and the rice is tasteless and too sticky (that happens when it isn’t cooled down properly*). 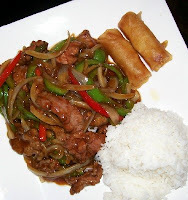 My friend Patti ordered the luncheon portion of pepper steak $7.45 which came with spring rolls and white rice. It was nicely prepared; it wasn’t too salty as this dish tends to be. During luncheon we were chatting with Mei-Lin Louie and her husband Sam, what a charming couple. They informed me that they own another restaurant in Silver Spring called Asian Bistro Café. 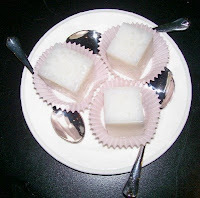 Mei-Lin sent out coconut pudding, which is a rice and coconut milk concoction with a jiggle like Jello. Mei-Lin explained that Chinese desserts aren’t very sweet. I really enjoyed this restaurant and I have many dishes I want to try above and beyond the Dim Sum so I will be back, probably many times. 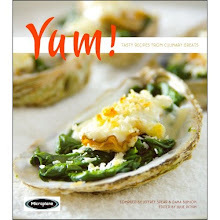 I’m intrigued with the soups and noodle dishes. If you live in the area they have delivery for a $25.00 order or more and curbside pick up. * Chef Nyghia Hoang told me that to properly cool sushi rice it must be done in a wooden bowl or box which can absorb some of the moisture as opposed to something plastic which keep the rice sitting in moisture. You will see fans blowing on the rice to help this process.